A trailblazing chef reinvents the art of cooking over fire. Gloriously inspired recipes push the boundaries of live-fired cuisine in this primal yet sophisticated cookbook introducing the incendiary dishes of South America's biggest culinary star. Chef Francis Mallmann—born in Patagonia and trained in France's top restaurants—abandoned the fussy fine dining scene for the more elemental experience of cooking with fire. But his fans followed, including the world's top food journalists and celebrities, such as Francis Ford Coppola, Madonna, and Ralph Lauren, traveling to Argentina and Uruguay to experience the dashing chef's astonishing—and delicious—wood-fired feats. The seven fires of the title refer to a series of grilling techniques that have been singularly adapted for the home cook. So you can cook Signature Mallmann dishes—like Whole Boneless Ribeye with Chimichuri; Salt-Crusted Striped Bass; Whole Roasted Andean Pumpkin with Mint and Goat Cheese Salad; and desserts such as Dulce de Leche Pancakes—indoors or out in any season. Evocative photographs showcase both the recipes and the exquisite beauty of Mallmann's home turf in Patagonia, Buenos Aires, and rural Uruguay. Seven Fires is a must for any griller ready to explore food's next frontier. Francis Mallmann is the reigning star of food television in the Spanish-speaking world, and the most famous and popular chef in South America. His restaurants include Siete Fuegos at The Vines Resort & Spa in Argentina’s wine country; Patagonia Sur in Buenos Aires; El Garzón in Uruguay; and 1884 Restauranté in Mendoza, Argentina (named one of Latin America’s 50 Best Restaurants). In the fall of 2015, he will open a U.S. restaurant at the Faena Hotel in Miami, Florida. USA Today and The Times (U.K.) have named his restaurants among the top 10 places to eat in the world. Most recently, Mallmann was the subject of the Netflix documentary series Chef’s Table. Peter Kaminsky is the author and coauthor of many books, including Pig Perfect, Culinary Intelligence, Seven Fires and Mallmann on Fire (with Francis Mallmann), and Charred and Scruffed (with Adam Perry Lang). He is a longtime contributor to Food & Wine and a former columnist for The New York Times and New York magazine. He lives in Brooklyn, New York. "Most of what's in this captivating book about cooking over wood is as straightforward as it is appealing." "Glorious...You could amuse yourself all summer long exploring Mallmann's methods. His cooking is utterly unpretentious." "[Mallmann] cooks with the elegant purity achieved only after attaining a mastery of complicated food." 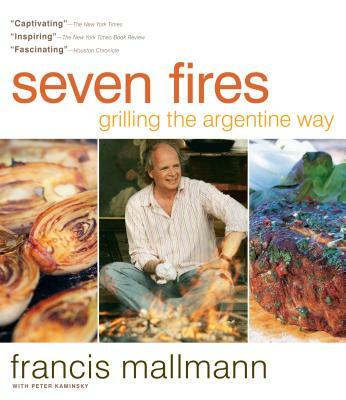 "[Mallmann] reconnects us to the primal simplicity and visceral pleasure of cooking over a fire." "Seven Fires is, in its essence, a love letter to Argentina's obsession with fire and food."